MONROEVILLE • AND MANY MORE! Railroad Earth’s Music on The Mountaintop is the premiere music festival in Boone, North Carolina, and is one of the nation’s first Green Festivals. 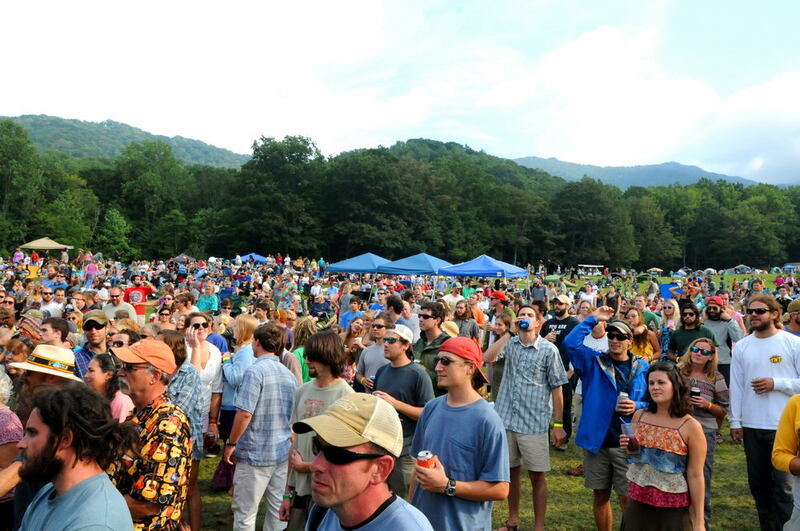 2012 marks the 5th annual three-day music festival outside of Boone, North Carolina on August 24-26th. It is Boone’s first and only multi-generational family festival offering three full days of music featuring national and world-renowned performers in Americana, Newgrass, Bluegrass, Acoustic, Folk, Funk & Eclectic, with camping, locally grown and organic natural whole food vendors. Railroad Earth’s Music On the Mountaintop will return for a 2nd year to the Grandfather Campgrounds in Foscoe, North Carolina. The picturesque venue is located approximately ten miles from Boone, North Carolina, providing potable water throughout, several public restrooms and bathhouses, a public store, and plenty of shaded campsites. Additionally, Music on the Mountaintop will expand to include late night shows (Friday and Saturday), VIP, Summit VIP and All-Inclusive ticket options, music workshops, daily yoga classes, cabin rental options, and a new offsite parking location just miles away. Performers include Railroad Earth X3; Dr. Dog; JJ Grey & Mofro; Sam Bush; The Dirty Dozen Brass Band; Greensky Bluegrass; The Hackensaw Boys; Larry Keel & Natural Bridge; Futurebirds; River Whyless; Holy Ghost Tent Revival, The Black Lillies; Monroeville; Naked Gods; Rose’s Pawn Shop, Stoney Creek Boys; Salem Speaks and many more. MOTM also features a series of workshops curated by festival hosts Railroad Earth. Taking place throughout the weekend, the members of Railroad Earth have created a series of interactive workshops designed to complement the festival and bringing fans closer to their creative process. Workshops are to include: Zen and the Art of Improvisation featuring Railroad Earth’s Tim Carbone, Greensky Bluegrass’ Anders Beck and Railroad Earth’s Andrew Altman; Introduction to Weird Instruments featuring Railroad Earth’s Andy Goessling; Mandolin 101 with Railroad Earth’s John Skehan, Sam Bush and Andy Goessling; and Morning Meditation with Tim Carbone of Railroad Earth. The weekend of workshops will culminate with an All-Star Jam celebrating the 100th birthday of Woody Guthrie. Joining Railroad Earth in celebrating the music of this legendary folk musician will be the Sam Bush Band, Larry and Jenny Keel and members of Monroeville. General admission tickets are offered starting at $99. The price includes three days of music, camping, and an alcohol fee. VIP packages will be made available this year with two levels, Ridge VIP and Summit VIP. Music on the Mountaintop is scheduled for August 27th and 28th, tucked away in the heart of the high country at Boone fairgrounds (formerly the Old High Country Fairgrounds). MOTM is the first ever green festival in Boone, NC and it took the High Country by surprise and is now entering it’s third year. What started as a class project at Appalachian State University grew into one of the largest musical events the town had seen in nearly a decade. Music on the Mountaintop has expanded this year to include two full days of unmatched music featuring several national acts, creating an eclectic blend of Americana, bluegrass, and acoustic funk and folk. Festival goers can enjoy a kids zone, a 30 ft. climbing wall and multiple jump arounds, limited 2 night camping, over 30 bands throughout 20 hours of music, 30 art and craft vendors, 10 interactive and hands on non-profit exhibits. Music on the Mountaintop is entertainment for people of all ages and backgrounds. MOTM’s Lineup includes Sam Bush, Railroad Earth, Keller Williams, Toubab Krewe, Acoustic Syndicate, Larry Keel and Natural Bridge, Yo Mama’s Big Fat Booty Band, Josh Phillips Folk Festival, Snake Oil Medicine Show, Holy Ghost Tent Revival, The Movement, Do it to Julia, Uncle Mountain, Now You See Them, The Mumbles, Big Daddy Love, Moon Taxi, The Native Sway, Naked Gods, Farm Vegas, BPL, The Moderate, Doc Aquatic, Mama’s Love, Sign of the Rhino, Tom Tom Roach, Gurad the Van, Southern Exposure and more. MOTM’s Mission is to bridge the gap between traditional business and environmental stewardship. Through the medium of music MOTM hopes to educate while entertaining, offering practical and useful information to help people live a more sustainable and green lifestyle. MOTM hopes by offering the best musical talent, as well as positive environmental message, “we can change the world one person at a time”. At the end of the day, MOTM hopes to offer a significant financial contribution back to the cause and research of renewable and alternative energy. Live Environmental Forum – Recreating an idea from the Bonnaroo Music Festival, MOTM is hosting a live forum made up of some of the the top artists performing. This will allow fans to interact with the musicians on relevant and current environmental issues. Similarly to the MOTM particular sponsor selections, MOTM also books musicians that have similar ecological mindsets. Food Drive – MOTM has teamed up with several Greek social organizations from Appalachian State University to host a canned food drive benefiting the local Hunger Coalition, as well as encouraging our attendees to give financial donations. The fraternities and sororities at Appalachian State have always had effective and generous community activism and we are happy to bring the two together. Other Greeen Initiatives include a River cleanup of the New River, solar staging, attentive recycling and composting campaigns, large scale shuttle and carpooling efforts. Non-profit beneficiary: This year MOTM has teamed with one of the most active non-profits out there today, Appalachian Voices (www.appalachianvoices.org) Appalachian Voices brings people together to solve the environmental problems having the greatest impact on the central and southern Appalachian Mountains, specifically air pollution and mountaintop removal. 2009 Details: In 2009, MOTM gave $5,000 to AIRE, recycled nearly 2,000 lbs of aluminum, and had over 4,000 in attendance., doubled from the year before. MOTM was voted number one green fest in country 2009 by Blue Ridge Outdoors. “The efficient, earth-conscious event requires relatively little land space, and the organizers strive and succeeded in making the festival one of the most environmentally considerate in the country. Volunteers combed the grounds all day encouraging garbage gathering and recycling, while a village of eco-conscious organizations and companies greeted the nearly 4,200 attendees upon entry. “One thing, though, that I really liked about some of the food vendors were those who were a little more conscientious about what was being served. For example, the food made by students using locally grown produce, and another who offered antibiotic/cage free chicken. Small things. But a step in the right direction. It was refreshing to have these types of options at a ‘green’ event such as this. Music on the Mountaintop in Boone Initial Lineup Announced! Music on the Mountaintop is a one of a kind, ecologically driven large-scale music festival, offering first class entertainment as well as educational awareness on current environmental issues. Music on the Mountaintop will now be 2 days! 3rd Annual Music on the Mountaintop, August 27th and 28th, 2010. Remember that the message of Music on the Mountaintop is to “Educate While Entertaining” and keep the messages of the event with you all year around. The first ever green festival in Boone, NC took the High Country by surprise. What started as a class project at Appalachian State University grew into one of the largest musical events the town had seen in nearly a decade. Nearly 2,500 attendees enjoyed a full day of top notch musical talent from the local and national scene as well as interactive educational exhibits promoting environmental stewardship provided by more than 15 non-profits from across the state of North Carolina. Music on the Mountaintop was entertainment for people of all ages and backgrounds. Whether it was enjoying the Grammy-winning dobro of Jerry Douglas, grubbing down on the local barbeque and burgers, or practicing your skills on the 30-foot climbing wall, there was certainly never a dull moment down at the High Country Fair Grounds. At the end of the day, MOTM hopes to offer a significant financial contribution back to the cause and research of renewable and alternative energy. The mission with Music on the Mountaintop is to bridge the gap between traditional business and environmental stewardship. Through the medium of music we hope to educate while entertaining, offering practical and useful information to help you live a more sustainable and green lifestyle. MOTM hopes by offering the best musical talent, as well as positive environmental message, we can change the world one person at a time.